Here is an idea for a short seconds Sideline Out of Bounds play to run against man to man defense that has three options. This post was contributed by from Syracuse Women’s Associate Head Coach Vonn Read. Vonn served as an assistant coach in the WNBA with the Phoenix Mercury, Orlando Miracle, and San Antonio Silver Stars. 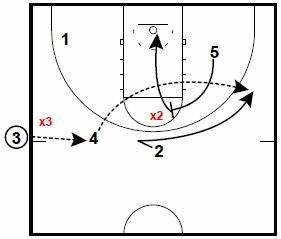 The 1 player will come off the screen set by the 4 player and curl to the basket for the pass. On the catch, the 1 player will drive baseline, looking to kick it to the 2 player in the corner for the 3-point shot. 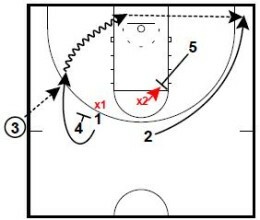 On the drive, X2 will get caught staring at the ball, while the 2 player flares to the corner off of a flare screen set by the 5 player. If you only need 2 points, the 1 player can drive for the layup. If the 1 player is not open, the 3 player will pass to the 4 player. The 4 player has 2 Flare screen options, either to the 2 player or 3 player. 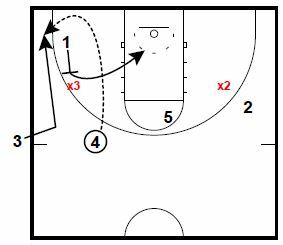 The 4 player can pass it to the 2 player coming off of the flare screen set by the 5 player. If you only need 2 points, the 5 player can slip to the basket for a layup on the flare screen. The 4 player can also pass it to the 3 player coming off of the flare screen set by the 1 player for the 3-point shot. If you only need 2 points, the 1 player can slip to the basket for a layup on the flare screen.